Even though it’s something we need every day, food has taken on a new status in today’s society. (There’s even a food interview on the radio while I’m writing this.) Everyone is talking about food. Some of the conversations are practical – food pyramid, food safety, enough food for everyone – but these are not in the spot light – although I could argue that enough safe food for everyone may be the only conversation we should be having. Most of the conversations are about what’s trendy – the newest recipes on the food network shows – which TV chef is the most interesting or exciting – what new foods are available and sure to improve our health and our lives. I just found out, now we’re supposed to be aware of the pH of our food too… ? Many of the conversations are about where our food comes from, who produces it, and more and more, how it’s produced and then processed. There are thousands of opinions. It’s really difficult to sort out who’s right, who’s wrong, what’s true and what’s false, and if there is any middle ground. Our VALOR II class recently visited the Shenandoah Valley of Virginia, a beautiful part of the Commonwealth where there is agriculture around every bend and over every hill. Sheep and lambs, Dairy cows, Plant Nurseries, Beef cattle, and Poultry – chickens and turkeys and eggs – plus all the crop growing enterprises that support them. There are also seed and fertilizer businesses, equipment dealers, financial institutions, feed mills, railway companies, media outlets, construction companies, all supporting or promoting agriculture in the area. And there are countless people involved in all of these enterprises, from laborers to educators, from managers to owners, from extension agents to bankers to members of the General Assembly. We had quite a weekend – and, yes, we ate really well too! But we were talking about food, not about a trip to the Shenandoah Valley. But let me tell you, a trip to the Valley is ALL about food. We all need to stop and consider that almost every bite of food we eat, every day, every meal, started on a farm somewhere. Every bite, except for the very few things someone catches or gathers. Think about it. Your breakfast of bacon, eggs and toast or yogurt and fruit or a smoothie with veggies or a bowl of cereal with milk – every bite from a farm. Every bite. 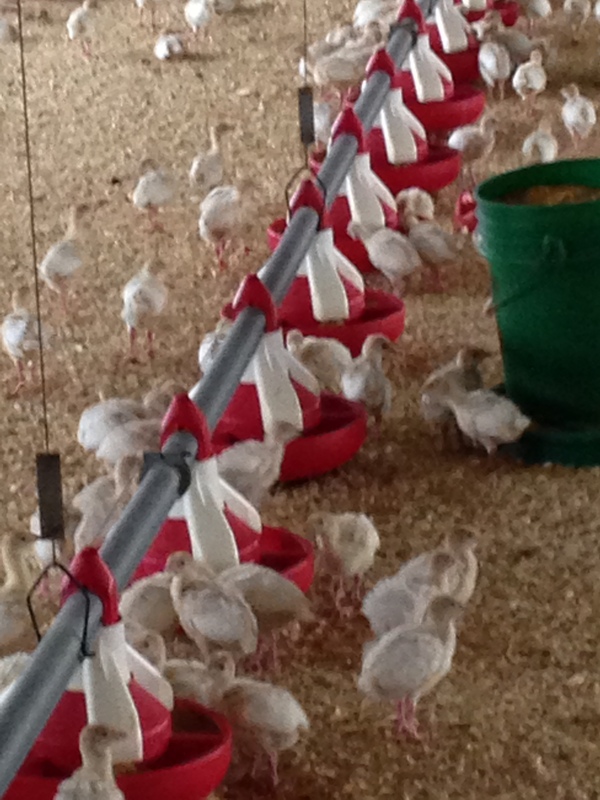 Chicken nuggets or a turkey sandwich or a big salad for lunch – farm raised – all of it. I could go on, but I hope you get the picture. And a great majority of the foods I just listed could be coming to you from the Shenandoah Valley. So what’s my point? There is an amazing diversity of farms and farmers, from those raising specialty crops and animals on a few acres, to those raising commodity crops on many acres, or livestock and poultry by the thousands. There is an amazing diversity of production practices used by those farms too. As a farmer that raises both commodity crops (cotton, field corn, wheat and soybeans) as well as vegetables for the local market, I find value in all types of farms and farming. We need every one of us, every farmer. So back to food. There are millions of choices. How great to have such an abundance and selection! But the reality is, there are millions of us, too – 320,062,000 in the US at last count – and we all need to eat every day and very nearly all of that food has to come from farms and farmers somewhere. Here’s an example: Just think if every one of us wanted ONE egg for breakfast – and consider that the average hen (backyard, cage free, free range, whatever) will lay about 4-5 eggs per week year round (about .75 eggs/day/hen) So for each one of us 320,062,000 people to have ONE egg for breakfast tomorrow morning, we need someone caring for, feeding, and cleaning up after, about 426,000,000 mature hens. And I know some of you will want TWO eggs! It’s mind- boggling. I promise no more math, but think about the numbers, the sheer volume of food for 320 million folks – the gallons of milk, the pounds of turkey, the bushels of grain, the baskets of vegetables and fruits. We watched a film over the weekend that made the claim we could go back to farming like we did it in the 1940’s – less fossil fuels, less chemicals, less fertilizer – more natural, more sustainable, more healthy – and it would only take 4 million more farmers. Consider this: there are currently only about 6 million farmers in the United States, very many of them at or over typical retirement age. I’m a naturally optimistic person, but finding 4 million new farmers, plus enough more to replace the aging ones, that are willing to take up this hard labor at farmer’s hours for farmer’s pay, taking the risks that farmers take and all of them using only the practices available from the 1940’s? Really? I think that our current system, although not without flaws, IS sustainable, IS providing healthy, safe food, IS using less inputs than 70 years ago, and IS being accomplished by less than 2% of those 320 million people. I agree that changes and improvements in all aspects of agriculture are necessary and vital for both farmers and our consumers – we all need to progress. Trying to learn about, figure out, and participate in the conversations about food and agriculture is a big part of why I wanted to join VALOR and I know with each new seminar, it was an excellent choice! For now, the variety and abundance of food out there is amazing, thanks in part to the Shenandoah Valley of Virginia. Hope you’re still hungry!